Like many folks, I love to shoot, but the economics of shooting as much as you want can get expensive with anything expect little .22s. The solution is of course reloading your own rounds, but when I starting looking around for information, I found losts of confusing information that wasn't really as straight forward as one would think. Sadly the best information I found was not in an article, but on YouTube. Hopefully this article can help you start creating cheap rounds to keep you at the range. I should go without saying, but I am not an expert and following my advise is of course at your own risk to gun, body, life and limb. HOW MUCH CAN I SAVE BY RELOADING? That depends on the typical rounds you shoot and how often. For standard range shooting and plinking out of my 357/.38 special I can usually pick up a box of 50 FMJ Winchester rounds for around $18. Assuming I save the brass/shells from that box of rounds all I need is a primer, charge, and bullet for the reload. Primers are around $3/100 ($.03 each) and the Berry's MFG 158gr HP are decent quality and run $28/250 ($.12 each). I can make around 500 rounds from 1lb of $22 Bullseye powder ($.044 each). Total that up and you have around $.194 per round or just under $10 per 50 rounds. The savings is $8 per box and I typically chew through 200 rounds every time out = Savings $32. Obviously I wanted to get into reloading to save money not as a hobby, and dropping $1000 on a reloading setup didn't seem to bright to me. The result was a handy little setup under $100 that allows me to sit on the couch with the wife while watching TV and crank out rounds. I'll note up front that like everything else there are a number of Reloading Equipment manufacturers and not all the various brands parts and pieces will work together. Dies from one may work with another, however not always. The most critical parts to match up are the press and die sets or any thing that attaches to the dies or press. Miscellaneous Case and Flash Hole Reamers can typically be any brand. I would suggest that your first go around with reloading to stick with one brand, I choose Lee Reloading as they offer a very high quality with a lower cost than almost any other brand. 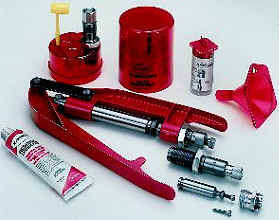 My reloading setup is based on a simple Lee Hand Press Reloading kit.